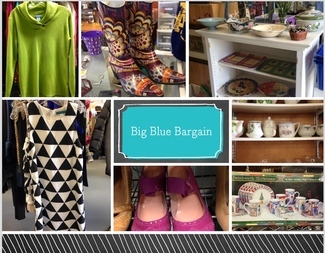 At Big Blue Bargains (BBB) you find gently used clothing and accessories for adults and children, as well as books, dvds, sports equipment, unique and antique items, and a variety of household goods and decorations. Big Blue Bargains opened its doors in January 2012. Since then, this unique thrift store has donated over $100,000 to the Swampscott Public Schools from the proceeds its made through its sales. In order for SHS to receive its disbursement checks from BBB, SHS must meet the minimum volunteer commitment and help staff the store with at least two volunteers on assigned dates. In addition to adult volunteers (parents, grandparents and other relatives), BBB welcomes student volunteers from SMS (Grades 7 & 8) as well as SHS (Grades 9-12). One of the perks of working at BBB is that volunteers receive 1/2 off on items they want to purchase on the day they are volunteering (2 hour minimum shift required/payment due that day). October 3 and 6, November 7 and 10, December 19, January 30, February 2, March 13 and 16, April 24 and 27, May 29, June 1, July 10 and 13, August 14 and 17. Big Blue Bargains is located at the back of the Middle School (207 Forest Avenue, Swampscott, 01907). Enter the side parking lot by the gymnasium and continue around the building past the cafeteria where you will see the brightly painted Big Blue Bargains door. Please also consider BBB for your donations of gently used clothing (please don't drop off clothes with stains, mold, or with pet hair), shoes, bags, housewares, linen, paintings, home decor and lighting, books, small furniture (i.e. small chair, end table, bookcase). The store also carries sportswear, sports equipment as well as cleats and ice skates. All proceeds go to Swampscott School PTOs. Please drop off donations during store hours. Do not leave donations outside when the store is closed. We regret, but we cannot accept the following items: electronics--computers and monitors, non digital cameras, VCRs and VHS tapes; clear glass vases from florists, textbooks, skis, cribs, infant car seats as well as booster seat, strollers, toys and board games and stuffed animals.